Opening hours: Low/Medium: From 2/1 to 30/6 and from 16/9 to 30/12 - 10:00 a 19:00 h. High From: 1/7 to 15/9 10:00 a 21:00 h.
The PríncipeFelipeScienceMuseum was designed by architect Santiago Calatrava. It contains three floors of approximately 8,000 square metres of exhibition space. The museum collaborates with the public due to its range of workshops, activities and interactive panels. The longitudinal building stretches 41,000 square meters and expresses a prehistoric-skeleton. Opening Hours: Low season from: 02/01 to 31/05 and from 16/09 to 31/12 - 10 h. - 18 h.10 h. - 20 h. Medium season from: 01/06 to 15/07 and from 01/09 to 15/09 - 10 h. - 20 h.10 h. - 20h. 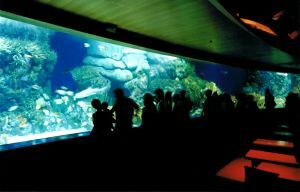 High season from 16/07 to 31/08 - 10 h. - 24 h.10 h. - 24 h.
The Oceanographic is a wondrous flaunt of an extensive variety of marine life in the magical setting that is, The City of Sciences. Currently, the largest marine park in Europe, across a water reservoir, you could spend a full day at this underwater world. The park is divided by every marine habitat around the world, there are species ranging from the Arctic to the Mediterranean . Opening Hours: Tuesday – Sunday 10.00 h – 20.00h, Mondays closed. Free Entry. Set in a renovated Baroque building, The fine Art Museum in Valencia is renowned for its collections of primitive Valencian painters. It has also obtained works from El Greco, Velázquez, Murillo, Goya and exhibits sculptures by Mariano Benlliure. Opening Hours: Monday – Saturday 10.00 to 14.00 and16:30 to 20.30. Sundays 10.00 to 15.00. Entry 2Eur. In this museum you can find the few figures “Fallas” that have been saved from the traditional burnings which takes place during the festivities las Fallas (see Valencia Calendar). Opening hours: Tuesday – Saturday: 09.30h – 14.00h and 17.30h – 20.00h, Sunday: 09.30h – 14.00, admission free, tel: 963941417; 14 17; Plaza del Arzobispo. Here contains crypts in this Visigoth chapel. There is also a 25 minute multimedia documentary on Valencia’s history and the saint San Vicente’s life and death. There are shows in English but you have to make reservations by phone or at the Palacio del Marqués de Campo. This chapel is just opposite the church.